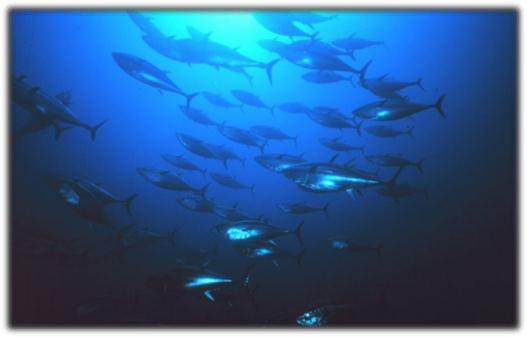 In 2013 NOAA, through the Atlantic Highly Migratory Species Division, will likely re-allocate bluefin tuna fishing quotas for all allowable fishing methods, known as gear types. 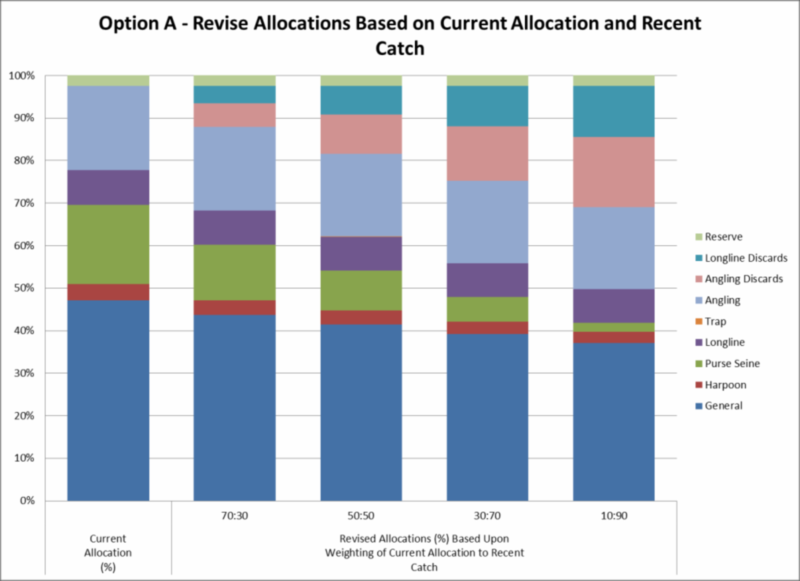 NOAA has categorized the redistribution of allocation among gear types as a “first tier” priority in the Amendment 7 scoping documents (NOAA 2012a). This amendment has potentially important and long-lasting implications to the bluefin tuna fishing sector. 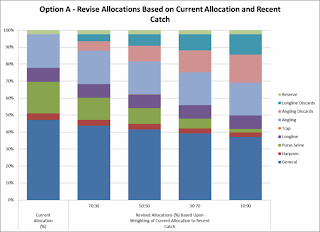 Redistribution could virtually eliminate the quota allocation for purse seine fishery. 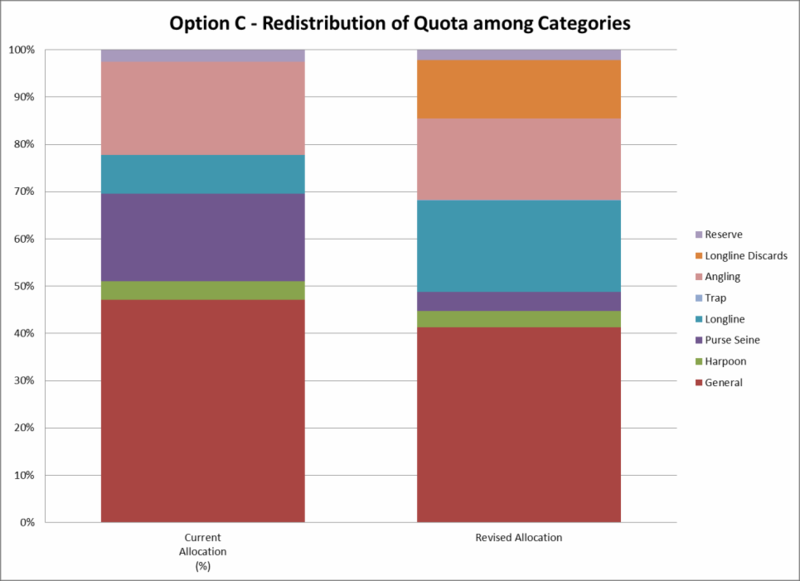 Such a drastic change to the “quota landscape” deserves close scrutiny to understand the cause and consequences of the change. In 2012, NOAA Fisheries (the domestic regulatory agency that manages Highly Migratory Species [HMS]) began the process of drafting Amendment 7 to the 2006 Consolidated Atlantic Highly Migratory Species Fishery Management Plan (Federal Register 2012). Amendment 7 will provide the framework for managing Atlantic bluefin tuna consistent with the legal mandates provided in the Magnuson-Stevens Act and Atlantic Tunas Convention Act for the foreseeable future. These mandates include ending overfishing and re-building stocks to ensure that populations return to healthy levels. The amendment provides the opportunity for enhanced reporting of catches, changes in the minimum retention size, designation of new temporal or spatial closures, as well as quota requirements that define, by gear and license types, the Atlantic fleet’s total allowable catch poundage. Amendment 7’s regulations will be crucial for the sustainable management of Atlantic bluefin and the conservation of the species. 1) The system does not accurately reflect the current distribution of fishing landings (fish catch brought to shore for sale). In particular, there has been a substantial increase in recreational catches (made by individuals rather than commercial operations) and a dramatic decline in purse seine category catches. 2) The current allocation does not account for dead discards, fish that fail to meet minimum size requirements or other criteria that prevent them from being kept. Released dead fish can dramatically reduce the potential profits of a fishing operation, a fact that is not fully accounted for by the current fish-landing allocation system. Recent science and data analyses have shown that dead discards can represent a significant proportion of stock biomass. Purse seining, a style of fishing that uses nets to encircle a school of fish, began in earnest in the Northwest Atlantic after World War II with a single seiner off the coast of New England. Gradually, more vessels joined the fleet, and the fishery reached its maximum catch in 1963 and maximum number of participating vessels in 1964. However, as purse seiners became more proficient and as new technologies became standard (e.g., using airplanes to spot schools of fish), capacity began to exceed fishing yield (Sakagawa 1975). Since 2006, landings have fallen well short of allocation. In three of the past six years there have been no purse seine landings at all. With profits eroding, only five vessels, home ported in Gloucester and New Bedford, Massachusetts, continue to use this method (NMFS 2006). In addition, NOAA no longer issues purse seine fishing permits, and regulations prohibit the transfer of permits. The failure of purse seining is largely related to fish harvesting and sale size restrictions imposed by NOAA. In general, purse seiners have to catch “giants,” larger than 80 inches in length (but are allowed a small amount of fish under this size). With purse seining, the relative size fraction of a school of fish cannot be discovered without significant effort and the risk of little return for that effort. The purse seine fishery was developed for catching fish for canneries (i.e., for canned tuna). Canneries prefer a smaller fish than the high-value Japanese sushi market. 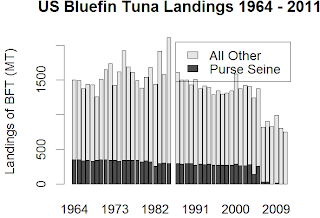 In 2004 and 2005, as “giants” became scarce, purse seiners also had to contend with a precipitous price drop for bluefin tuna from a high in the late 1990s of approximately $9/lbs to $2.18/lbs in 2005. As a result, purse seine fishing no longer made financial sense. Simultaneously, New England sea scallop fishery was becoming the most valuable US fishery, drawing interest away from bluefin tuna. Without the return of bluefin tuna schools with “giants,” the purse seine fishery has been quiet; and since 2006 the quota allocated (18.6%) to the purse seine fishery has been a defacto reserve for the rest of the fishery, essentially serving to cover overages and accounting for dead discards by other gear types. While some have suggested that relaxing minimum sizes requirements might revitalize thecategory, this change is unlikely because of NOAA’s commitment to protect smaller fish to allow them to reach maturity and spawn. Alteration of size minimums and purse seine catch tolerances has already been relegated to secondary status in Amendment 7 scoping. 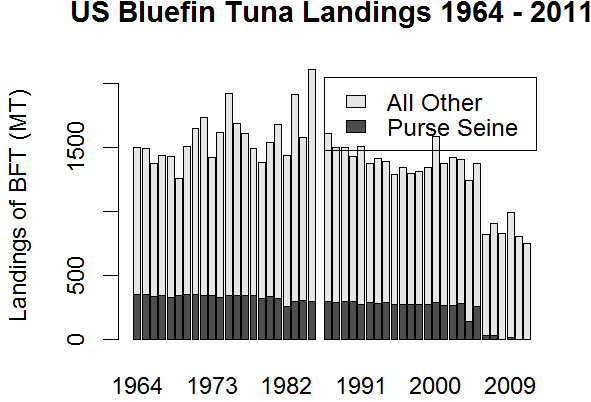 Purse seiners may have to wait until Atlantic bluefin schools have matured before returning to profitability. Predicting when - and if - this utilization of quota will occur is a management issue. 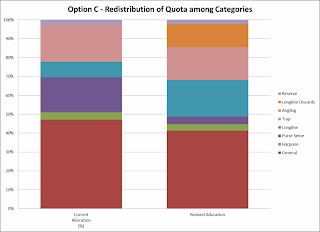 C) Redistribute quota from gear types that have not met allocation (in recent years) to categories that have insufficient quota to cover (NOAA 2012a). Option A. When recent catch is considered most heavily, the purse seine fishery all but vanishes. Categories that lose quota are the harpoon and general categories. The excess quota “gained” from the “losers” is transferred to the angler (recreational) and the longline categories, the new quota would be used to account for their dead discards while leaving there landings at current levels. Using this option, the defacto quota reserve of the purse seine fishery becomes official reserve for the longline and the angler categories. The more weight given to recent catch, the larger the reserve. Option B. This option draws quota from each category, thereby creating additional reserves. For example, each category may experience a 10% cut. Gear categories that are particularly unselective an discards, such as longline, couldreceive greater cuts than other categories. 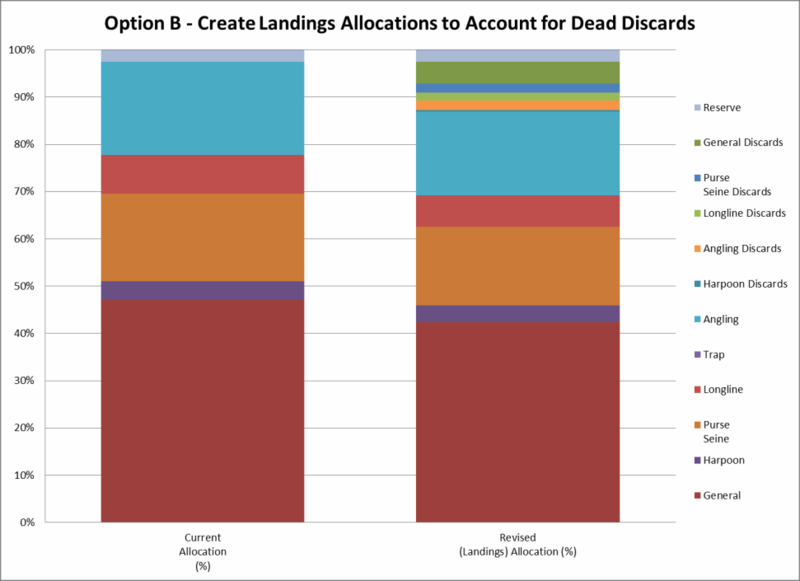 In this option, purse seiners would maintain a substantial amount of their quota, leaving each of the remaining categories to account for their dead discards. This option has the potential to provide additional defacto reserve, but leaves fishery managers with the uncertainty of hen, and if, purse seiners will return to fish. Option C. This option disproportionately affects purse seiners as it redistributes quota from their fishery to the longline fishery to cover dead discards. Again, this option essentially eliminates the defacto reserves that the purse seine category has provided over the last six years. As NOAA Fisheries continues to refine the Amendment 7 draft, it will need sound and reasoned input from citizens concerned with our natural resources and, in particular, the bluefin tuna fishery. People will have the opportunity to comment on the proposed amendment before it becomes regulation. Ultimately, the fate of the purse seine fishery will have important implications for at least the next 10 years of bluefin tuna management. Threatened Species. Version 2012.2. . Downloaded on 29 October 2012. NMFS. (2006) Final Consolidated Atlantic Highly Migratory Species Fishery Management Plan. National Oceanic and Atmospheric Administration, National Marine Fisheries Service, Office of Sustainable Fisheries, Highly Migratory Species Management Division, Silver Spring, MD. Public Document. pp. I hope you write more about this in the future... I'm just starting to learn more about them I'm not familiar with this. Thanks.